Earlier today, a tweet by Ellie Sharman about a two year old Liberal Vision article almost prompted by to write about its wrongheadedness before I realised that I had already done so. That was that, I thought, until I read this article about how the beleaguered Health Minister had been forced to restore his cuts to the public health campaign budget after evidence emerged that the cuts had actually lead to an increase in flu deaths, as well as a decline in things like people joining programmes to give up smoking. What does this have to do with airbrushing? Well, for me it highlights a pretty fundamental point: advertising works. Andrew Lansley has at least given us a bit of evidence we can now draw on in future to ensure that the mistake is not repeated. It is the fact that advertising works that sums up why I am not a libertarian or classical liberal. Brains can be manipulated and even fooled; we aren’t rational beings. The libertarian assertion that if you just took state action out of the equation, people would act rationally simply isn’t backed up by any credible evidence. And of course they end up tying themselves up in knots attempting to prove it. So it was that in his Liberal Vision article two years ago, Tom Papworth found himself implying that “airbrushing” doesn’t manipulate young women and that to assert that it did so was to suggest that it does is to brand them as “stupid”. The idea that people can be manipulated on a psychological level and not be cretinous does not sit well with libertarians. Yet the simple fact is that if psychology did not have a large part to play in advertising, it would not have evolved in the dramatic way that it did over the course of the 20th century, and people would not now be lamenting the delay of Season 5 of Mad Men. When the government produces an advert designed to encourage you to give up smoking, it is explicitly attempting to manipulate you. That doesn’t sit terribly well with classical liberals, yet why is it such a dreadful thing for a democratically elected and ultimately accountable government to be doing it but not a commercial company which is only accountable to its shareholders? Psychology and neuroscience represent massive challenges for liberalism which it can’t afford to ignore. It isn’t that the principles at the heart of liberalism are flawed, just that their real world application are inadequate. This is what the new liberals realised at the start of the 20th century and it is something we must be continually alive to. Yet there remains a strand which defiantly refuses to acknowledge this and wraps itself in the easy slogans and notions about rationality of the Victorian Age. As a result of the government spending millions of pounds encouraging people to live healthier lifestyles, people’s lives – and thus liberty – are improved in a tangible, measurable way. It is right that governments continue to do so, notwithstanding the fact that there is a real debate to be had over how far it should go. It is equally right that politicians such as Jo Swinson raise issues about advertising and body image with initiatives such as the Campaign for Body Confidence; again notwithstanding the fact that some of the conclusions they draw are liable to be problematic. To suggest that there is some simple, magic liberal litmus test which we can apply to difficult areas such as this is the ultimate act of illiberalism. The Lib Dem womens’ policy paper has now been published so the ‘airbrushing’ debate can now move away from what is being said in the media and onto what the policy paper actually says. The first thing that should be noted is that nowhere do the words “airbrushing”, “Photoshop” or “ban” appear. The clauses are much less prescriptive than last week’s hype might have lead us to believe. I still have two significant problems with these clauses however. Firstly, the paper provides no evidence whatsoever to convince us that this would be an effective remedy. Not even a footnote (there are footnotes and anecdotes for other proposals). Secondly, it fails to explain why advertising is being singled out here when the magazines that such adverts are to appear in are not. There does not currently exist a regulatory body to control what can appear on the front page of magazines. All the time they continue to pump out idealised images of women (and they do that because it sells) then why get worried about what appears on page 92? When you break it down it appears like a fairly meaningless sop. Having read the paper I don’t think it gets to the heart of the problem at all. As such, I fear that this is selling short the very women and girls that the paper is seeking to protect. 23 and 24 are surely unobjectionable as they are simply urging best practice and not even regulatory. For non-libertarians, 25 seems a pretty common sense measure, aimed at providing people with useful information. 26 is all well and good, but I have to say I question the wisdom of adding to the already long list of things we make teachers cover in schools; I thought we were demanding a bonfire of the curriculum as recently as March this year? Either way, I am sceptical how a lesson one afternoon in school is going to achieve much. In short, I can’t help but feel this is just scratching the surface of what is a much more complex issue. [The main problem the Green Party faces is] it’s open and democratic approach to policy-making in which any member can put forward a policy, call for vote and get the policy accepted into the party’s manifesto if it prove popular with members too readily militates against evidence-based approaches to policy making, particularly in a party that typically attracts considerably more than its fair share of proponents of pseudoscience. He’s writing about the Green’s anti-science policies but before we get to smug about their often loony ideas we should pause for thought about how the Lib Dems are often subject to the same forces. I don’t agree with Unity and Martin Robbins that the problem is democratic policy making processes; Labour has torn up its democratic structures but its policies are if anything less evidence-based than the Lib Dems’. But people need to be wary of voting at party conference in favour of “nice things” and demand a more rigorous approach. It is notable that the party’s Federal Policy Committee has failed to demand this itself in this instance. Perhaps this is a good example of how the policy paper model, imposed during the merger period by the SDP wing, doesn’t particularly work very well. Certainly the rules about policy papers having to have specific word limits works against a more evidence-based approach. I’m confused about this latest ad ban. Which character is meant to be gay? The one who is walking peculiarly, or the one wearing lots of gold jewelry, referring to pride in the “man race” and chomping down hard on phallic shaped object demanding that we “get some nuts”? If this ad is meant to represent the ultimate hetero bashing a homo, I’m Mad Murdoch. Over at BAE’s favourite leftwing magazine, Richard Herring writes a blog post I’ve been meaning to do only puts it far more eloquently and humourously. 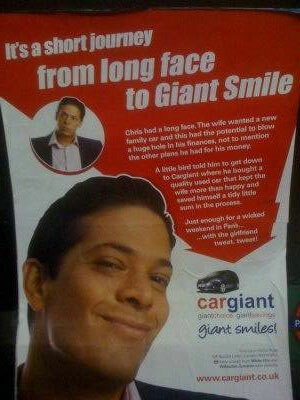 One thing he doesn’t mention is that Chris’ “giant smile” on the advert doesn’t really look like a smile at all. Smug is one way of putting it. Another is to point out it looks rather similar to the expression one has when one has a mouthful of someone one does not know whether to spit out or swallow. Nothing wrong with that of course, but I’m pretty sure he didn’t get that from his wife or girlfriend. Clearly there is another dimension to this sad squit’s life that has yet to be told. Is it me, or does this story look like its come through a timewarp? The Conservatives say they are adopting a “fresh approach” to politics with a pre-conference advertising campaign that will run exclusively online. If this had been a story published at any point during the last century, then it might have been newsworthy. But in 2007? On a not-particularly slow news day? Who has Andy Coulson been sleeping with to get this kind of coverage? Plaid Cymru are crying foul over the BBC’s decision not to throw the Representation of the People Act out of the window and allow them thousands of pounds of state-subsidised advertising. All I can say to that is: ha ha. If Plaid should be angry at anyone, it is the Welsh Rugby grounds who signed a contract that they surely knew they had no ability to fulfill.